This is what I needed! The color is great, too. 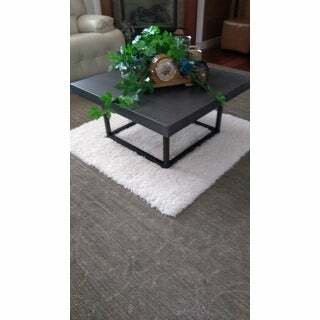 I didn't want bright white but wanted soft and subtle and that is what I would call this rug. I did hope that the pile was a bit denser but overall its a good value. 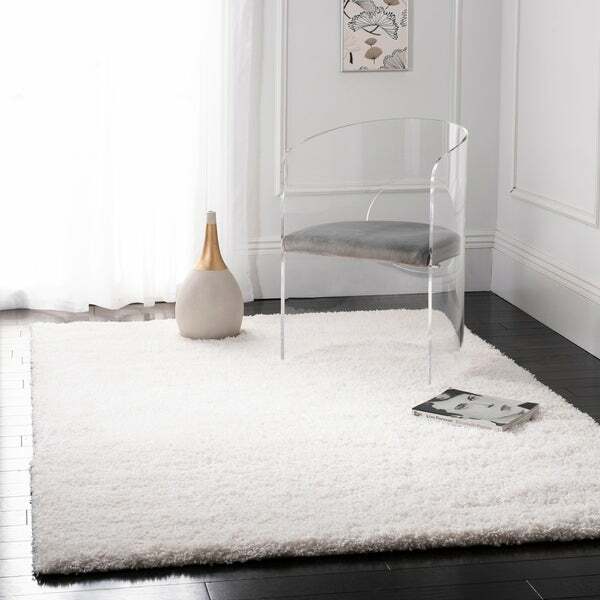 Celebrate the casual and carefree West Coast aesthetic with this 4' square cozy milky white shag rug from Safavieh's sensational California Shag Collection. Instantly brighten up any hardwood or tile floor to create a calming atmosphere that allows for a wide range of versatile styling options. This rug is exactly as titled; it is very cozy. I have a 4' square dining room table sitting on top of it and I love to curl my toes up in the deep shag. The color is definitely pure white and I have not had any problems in several months with cleaning it or it shedding. I loved the shag and the color when it came, but it was creased for a long time. Then it got dirty very quickly. I am so glad I did not get the 8 x 10 size. I had it professionally cleaned at our best place which cost $$ and it did not clean well, so I put it in my bedroom hoping to keep it from getting dirty again and it looks bad already. I will be giving it to Good Will soon. We’ve recently upgraded the master bedroom, bath and closets in our home and the 4’ x 4’ Safavieh California Cozy Plush Milky White Shag Area Rugs (we purchased two of them) were put into our “his and her” closets. They look beautiful and add just the right amount of elegance to them. They are plush and very comfortable to stand on. Very good price for the nice quality of these Safavieh area rugs. I love the Safavieh shag rug I purchased. It's unsurpassed quality is very evident and the milky white color is lovely in my room. This white rug is not as white as I was expecting. It is a beautiful rug and I would not call it off white. It’s on of those rugs that looks white until you put something white next to it. I bought this rug to go in my walk in closet so I think that it will be fine. Rug is soft but not fuzzy. I wanted this for bathroom, right below the shower/tub and it's been perfect. Gives nice padding for freshly cleaned feet! :) stays clean too. Very plush and thick. I have three of these rugs in my master bath. They are very absorbent though they are not marketed as bath room rugs. Safavieh is a great brand n the pricing on Overstock is super competitive. Very nice rug, my bedroom is navy blue, nugget, white and grey... This rug actually gives the room flare!!! I chose nugget (gold) for a pop of color... it looks great! Thanks Overstock! 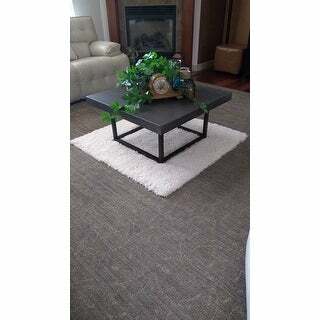 Beautiful rug with great texture and price. We are using it in our daughters room and it’s exactly what she wanted/expected from the photos online. Overall average for price. Pile is medium. Not too soft to touch but workable. Well made, nice and plush! This rug is not 4 x 4 - maybe a 3' x 3' at best. I’m 5’2” and when I laid next to it it came up past my mid-section a little. Cost to return the item will run me $***. Will not be shopping on Overstock again. Exactly what I wanted! Shipped very fast as well! This rug is just what I wanted! Nice and thick, feels great on the feet, great quality! "I need a 8x10 does this come in that size?" "Is this rug as big as the one that's in the picture? " This rug is a 4 foot x 4 foot square rug. "Cab I use this rug in a bathroom?" This is not recommended for use in the bathroom. I realize Overstock does NOT recommend this rug for bathrooms but, I have this rug in my bathroom and LOVE, love, love It! If it looks dirty or "flat" I simply vacuum it and it looks like I just got it from Overstock. Its polypropylene so it's pretty close to indestructible. I do not speak for Overstock. I say for myself, if you want to put it in your bathroom, you most likely, will not regret the decision! Try it you'll like it! 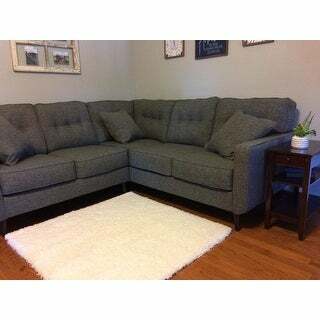 "Will this 4" rug be to big to go under a small cocktail table in a living room?" No, this should look just fine with a small cocktail table in a living room. Adding area rugs in different rooms. Hello Jesse9731, the backing on the rug is hard it will not hold up well in the washing machine. You can spot clean with damp sponge and mild soap and steam clean when needed. Thank you for shopping with us!